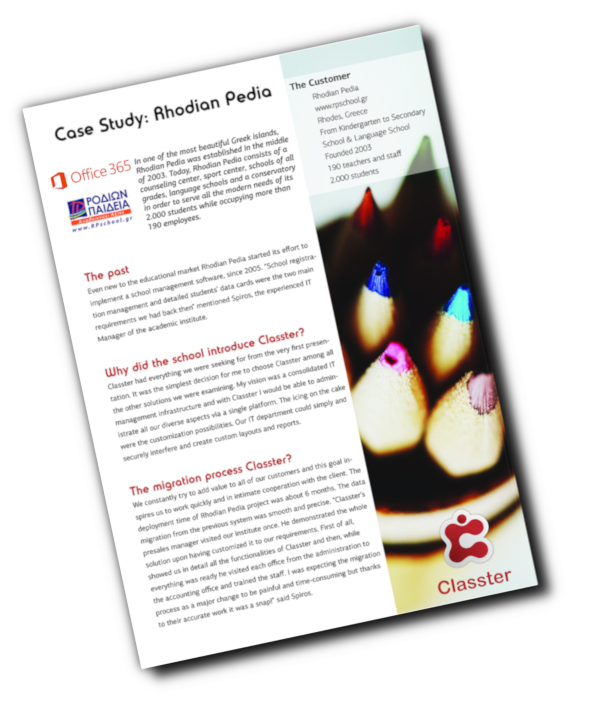 Another important asset that makes Classter platform highly valuable is that it is fully integrated with Moodle LMS and Office365. Any student or teacher registered as active in Classter can automatically get an account to Moodle LMS, and based on their Classter enrollments to subjects and groups, Moodle courses will be assigned to them. In addition, any enrollment changes in Classter or changes in student or teacher status will be automatically be reflected in Moodle. Using a Single Sign On (SSO) mechanism, students and teachers can access Moodle courses from within Classter dashboard. Similarly, Office365 for education is also fully integrated with Classter and students, teachers or even parents and employees creating an account in Classter can automatically get an Office365 account. Moreover, E-Mail boxes are automatically provisioned by Classter. What is more, Classter also assigns all Office365 licences and creates security groups. All users are automatically assigned to security groups based on Classter’s configuration. By using a single sign-on mechanism, teachers and students can access not only Moodle courses but also Office365 subject libraries allowing institutions to use all three systems as one unified solution.